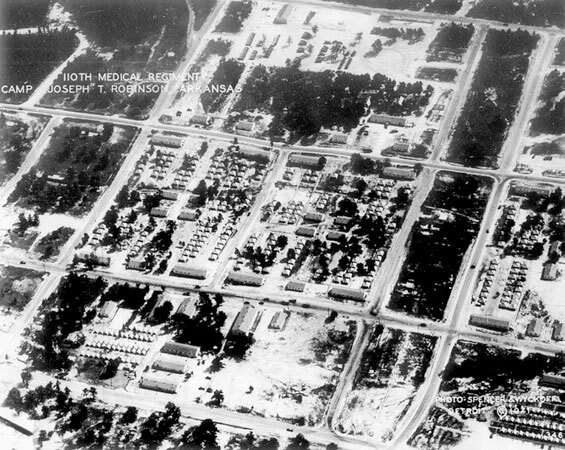 Partial aerial view of Camp Joseph T. Robinson, Little Rock, Arkansas, where the 298th General Hospital was activated. When Germany invaded Poland in 1939, and the war was about to expand further in Europe, Dr. Albert Furstenberg, Dean of the Medical School , University of Michigan, Ann Harbor, Michigan, from 1935 to 1959, began formulating plans for a General Hospital to serve his country. By mid-1940, the Medical School had become the nucleus and official sponsor of the Army’s new 298th General Hospital and plans to start training a medical staff were put in motion. The unit was called for duty soon after the treacherous Japanese attack on Pearl Harbor of December 7, 1941, and the all-volunteer force of Doctors and Nurses organized at the University of Michigan would be readied to serve overseas. 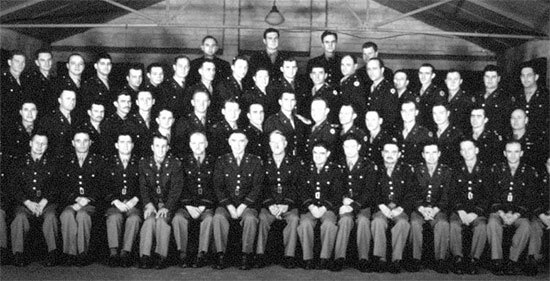 The 298th Gen was in fact an amalgam of two other units, one of which came from the University of Michigan and consisted of medical and nursing personnel from the University, where it had been started in 1940 as indicated above. However, as it consisted only of University Doctors and Nurses, it lacked the “general” skills such as cooks, clerks, orderlies or any of the many other “specialties” required to run a Hospital Plant efficiently. Consequently, when the need came, the staff were sent to Camp Joseph T. Robinson, Little Rock, Arkansas, where another General Hospital was stationed. This was the 214th General Hospital (already activated June 1, 1941 –ed) which consisted mainly of all the personnel lacking in the 298th, but had virtually neither MC Officers nor ANC Officers of its own. In fact it consisted of only 4 Officers and approximately 300 Enlisted Men. The Michigan people arrived at Camp Joseph T. Robinson, on June 27, and the combined Hospital took over their number. Signpost indicating the 298th General Hospital. The 298th General Hospital was officially activated on June 27, 1942, at Camp Joseph T. Robinson, Little Rock, Arkansas (Infantry Replacement Training Center; overall acreage 42,124; troop capacity 2,596 Officers and 44,077 Enlisted Men –ed). (each Company numbered 270 personnel, total capacity was 13,500 trainees, and training cycle covered 8 weeks in total; in 1944, the Branch Immaterial Replacement Training Center (BIRTC) was replaced by an Infantry Replacement Training Center, whereby the existing MRTC units were converted to Infantry training units, increasing the training capacity to 21,000 men –ed). The organization would spent 3 years overseas operating Hospital Plants in England, France, and Belgium, before returning to the Zone of Interior on September 23, 1945. After being officially ordered to active duty, Lt. Colonel Walter G. Maddock, MC, an associate Professor of Surgery commanded an initial cadre of 28 Physicians, while Captain Margaret K. Schaefer, ANC, was charged with organizing a complement of 120 Registered Nurses. Some aspects of training while the 298th General Hospital was stationed at Camp Joseph T. Robinson, Zone of Interior. Left: Ready for Litter Drill. Center: How to perform a Leg Splint. Right: How to treat and bandage a Head Wound. Staging and preparation for overseas movement started October 14, with the unit entraining for Camp Kilmer, Stelton, New Jersey (Staging Area for New York Port of Embarkation; overall acreage 1,815; troop capacity 2,074 Officers and 35,386 Enlisted Men –ed). 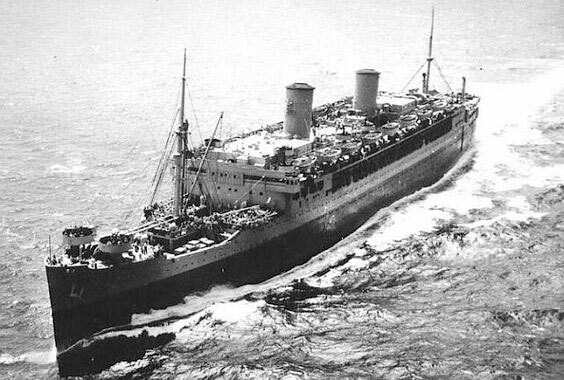 Following due processing and briefing, the Hospital sailed from the New Jersey docks on the S/S “Mariposa” on October 20, 1942, with destination the United Kingdom. The crossing proved uneventful, except for lack of luxury and primarily space considering the way the Enlisted Men were bunked four-deep in the ship. Officers and Nurses were more lucky as they were housed in separate cabins. Vintage photo illustrating the S/S Mariposa Transport which carried the 298th General Hospital overseas to the United Kingdom. In the early years of the Second World War, Bristol was expecting many casualties to result from the Blitz. So an Emergency Medical Services Hospital (E.M.S. –ed) was built, with 16 wards, on the site of the Frenchay Children’s Sanatorium. But the Blitz was not as severe as expected, so the Hospital facility remained largely empty. When the Americans joined in the war after Pearl Harbor, and the general build-up of US Forces began in the United Kingdom, the British Government and the Bristol authorities offered the use of the Hospital to the Americans in anticipation of the Invasion of continental Europe. The United States Army accepted the Hospital, but considered it too small, so a further 15 wards were built. Extension works by a local contractor were soon under way and included the building of: 12 General Wards, 1 Isolation Ward, 3 Officers’ Wards, 1 Officers’ Dining Room and Recreation Area, 2 Stores, 1 Mental Ward, 1 Patients’ Recreation Ward, 1 Twin Operating Theater, 1 Water Tower, 1 Cook House, 1 Fire Station, 1 Guard House, 1 Gas Defence Stores, 1 Post Exchange, 1 Dental Clinic, 1 Operating Wing Boiler House, 1 Chapel, 1 ENT Clinic, 1 Nurses’ Mess, 1 Office and Quartermaster’s Building, 3 VD Wards, 1 Boiler House, 1 Sick-call Clinic, 1 Enlisted Mens’ Dining Room and Recreation Area, 1 Pumping Station, 1 Officers’ Wash Area, 6 Junior Officers’ Living Quarters, 5 Sergeants’ Living Huts, 1 Sergeants’ Club Room, 1 Sergeants’ Ablutions Hut, 3 Enlisted Mens’ Latrines, 3 Enlisted Mens’ Bath Areas, 3 Enlisted Mens’ Ablutions Huts, 34 Enlisted Mens’ Living Quarters, and 8 Air Raid Shelters. Vintage photo illustrating a group of Medical Officers pertaining to the 298th General Hospital. Photo probably taken during the unit’s stay at Frenchay Park, near Bristol, England. (after the war, the Frenchay Hospital facilities were handed back to Bristol by the Americans in an official ceremony which took place on August 17, 1945). Following debarkation at Bristol Port, the group of men and women were taken to the village of Frenchay, outside the city of Bristol, Gloucestershire, England, where they took over a partially built hospital intended for use by US Armed Forces, in view of their massive build-up in the UK. Operation “Bolero” was the commonly used reference for the code name of the United States military troop build-up in the United Kingdom during World War II in preparation for the initial cross-Channel Invasion of France. 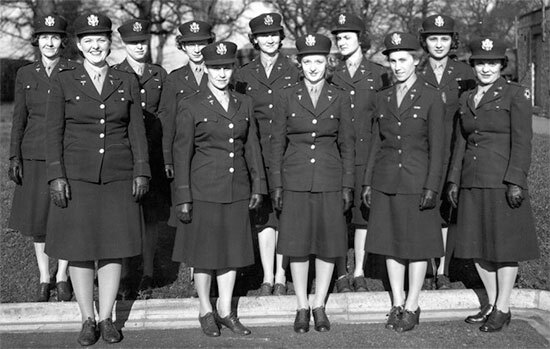 Vintage photo illustrating a group of Army Nurse Corps Officers of the 298th General Hospital while the unit was operating in the United Kingdom. The 298th General Hospital (the first of the more permanent large medical units which arrived in the United Kingdom –ed), which began to function November 11, 1942, at Frenchay Park near Bristol, was the third General Hospital to be established in England. Because it was located close to a major port on the west coast (in the Western Base Section –ed), it gained valuable experience with battle casualties before D-Day, which proved of great benefit in its later work in France and Belgium. Starting in the spring of 1943, the patients first received were evacuated from North Africa, Sicily, and Italy. During 1943 while operating Hospital Plant # 4166, the 298th Gen Hosp received 573 battle casualties, of which three out of four injured servicemen were patients suffering complicated fractures of knees, elbows, and ankles, in short chiefly fractures of the extremities requiring long-term treatment. About 80% of these patients were British, it being the policy of the British to send to the 298th General Hospital the most seriously ill patients from each Hospital Ship, because the proximity of the hospital installation to the port eliminated the necessity of a long trip by train or ambulance. Shortly after the arrival of the 298th General Hospital, local women of the nearby village were encouraged to train as volunteers to help in the Hospital. The British Red Cross recruited and identified these volunteers and a training program was set up in which a number of Medical Department Doctors and Nurses and the American Red Cross participated. Thirteen (13) women received their qualifying certificates in May 1943 and another further 24 in July 1943, enabling them to work in various parts of the Hospital, including the Library and Handicraft Section. The ladies also coped with flower arrangements and accompanied patients to social functions if necessary. The 298th General Hospital staff assisted by local civilians planned a market garden and planted trees, shrubs, flowers and grass around buildings and also improved paths and roadways. US Army medical units handled casualties of both nations (Britain/United States) at the Bristol Channel ports. Between 17 December 1942 and 8 April 1943, Company C, 53d Medical Battalion, operating under the supervision of the Bristol Port Surgeon, discharged 7 Hospital Ships arriving from North Africa at Avonmouth, moving over 2,100 casualties, among which 660 Americans, to the nearby 298th General Hospital. Vintage photo illustrating some Enlisted personnel of the 298th General Hospital, at Frenchay Park, England. These patients required considerable attention and the exercise of keen surgical judgment. They had been wounded on an average of 6 to 8 weeks before their reception. Many had not received wound debridement within the optimum time, and, as might be expected, the incidence of wound infection and osteomyelitis was significantly higher than in battle casualties later treated on the Continent. Since Penicillin was not yet available, all the patients received sulfonamide therapy. The plan of treatment, because of the time lag, was chiefly to carry on with the closed plaster technique until the wound and the fracture had healed. Every endeavor was made to improve the general health of the patient during this time. Drainage operations were performed as indicated, and the position of the bone fragments was improved whenever that was possible. It was the opinion of the Hospital staff at this time that the closed plaster technique was of great value in the management of war wounds and fractures and that Plaster-of-Paris casts served adequately for transportation. After the pressure of the North African campaigns had subsided, a new task lay ahead involving planning medical support of the American build-up in the British Isles. This involved calculating the numbers of hospital beds required in accordance with the increases in troop strength, and determining the location of Medical Department installations to suit changes in troop density in the various locations. Arrangements were furthermore made for MC Officers stationed in ETOUSA to attend courses in the various medical specialties taught at British institutions, such as the Royal Army Schools for Doctors and Dentists at Aldershot, Hampshire, the London School of Hygiene and Tropical Medicine, as well as at British Army Hospitals. Two (2) Schools were established within the Army’s American School Center, Shrivenham, Berkshire, in February 1943. The first was The Medical Field School emphasizing CWS courses, hygiene, sanitation, combat medicine, surgery, and the other The Army Nurse School training Nurses in all aspects of their work. Special courses for Officers and Enlisted Men were provided (in various specialties) at selected General and Station Hospitals. Apart from the training issues, a heavy task was to obtain in crowded Britain sufficient buildings to accommodate incoming US Army fixed Hospital units and to provide sufficient beds for military patients once the Invasion of the Continent began. The British Government turned over to the Army Medical Department (Reverse Lend-Lease –ed) a number of Hospital Plants constructed for the Emergency Medical Service, and large-scale construction was undertaken to meet the requirements for 90,000 hospital beds called for under the “Bolero” Plan. Thanks to the concentrated efforts and the assistance of the British Ministry of Works and Planning, British civilian contractors, the Royal Engineers and the RAMC, including the US Army Corps of Engineers, 58 fixed US Army Hospitals were operating in the British Isles by end of 1943 ( in total; 3 Evacuation, 4 Field, 17 General, and 34 Station Hospitals –ed). Some general views of the 298th General Hospital while set up at Frenchay Park, near Bristol, England. Left: Partial view of the wards at Frenchay Hospital. Center: Partial inside view of wards at Frenchay Hospital. Right: Arrival of a group of walking wounded evacuated from the Continent, at Frenchay Hospital. The non-military experience of the 298th General Hospital can be taken as typical of that of most of the General Hospitals serving in the United Kingdom before D-Day. Before the Invasion of the Continent, June 6, 1944, like most other Hospitals in Great Britain, the organization was performing station-type hospital duty, which included servicing the numerous troops in training. During the period ending in May 1944, the Orthopedic Section of the Hospital treated approximately 2,300 patients with civilian-type orthopedic conditions, chiefly fractures, dislocations and sprains, arthritis, bursitis, cicatrices, osteochondritis, osteomyelitis, poliomyelitis, synovitis, an occasional amputation, and some cases of frank psychoneurosis. This type of work was sufficient to keep the Orthopedic Services of all the Hospitals busy. Aside from accidental injuries, chiefly from automobiles and other mechanical equipment, most of the orthopedic material consisted of patients with disability of the feet, back, and knees. The majority of these complaints originated from among soldiers who were over age and who suffered conditions that rendered them unfit for actual combat duty. The difficulties of these troops were for the most part problems in re-assignment rather than actual medical or surgical problems. Line Officers hesitated, and often refused outright, to reclassify them, with the result that the Outpatient Departments of most Hospitals had large clinics filled with soldiers who were seeking downgrading. These men really needed little treatment, though they occupied a great deal of professional personnel and time. They were referred to the clinic simply because all combat units were endeavoring to streamline their personnel and to obtain as physically perfect combat teams as possible. All combat units were finally directed to follow Circular No. 96, July 15, 1943, issued by Headquarters, European Theater of Operations, Paragraph 2, which emphasized the necessity of trying to find places of limited duty with individual units before men with so-called civilian-type disabilities were admitted to Hospitals for possible re-assignment. All the Hospitals in England were cluttered with such cases, and many unwise elective operations were conducted in an endeavor to place essentially unfit men on full-duty status. This proved an impossible task. Apart from the above-described situation, the patient load itself was not so heavy, and both staff and personnel found time to enjoy bicycle trips, baseball games, Liberty passes, and the presence of British girlfriends. The highlight of British-American socializing was a visit by Queen Mary. In the meantime however, medical units developed their training schedules under supervision and inspection of the Base Section Surgeons, of the SOS and of Field Army and Army Corps Surgeons of the Ground Forces. Each unit was invited to send its quota of men to the various Schools in England. General and Station Hospitals held field exercises to practice receiving and caring of “simulated” casualties. Staffs and Commanding Officers of General Hospitals were awaiting early orders to move to France after D-Day and continued practicing tent pitching and striking and devoted time to improve physical condition with cross-country marches. Officers and EM of the 298th, by the time of the Normandy Invasion, were in good enough shape to cover 12 miles of hilly terrain, with full combat packs, in 3½ hours, while Nurses would go 7 miles in 2½ hours, wearing combat clothing, helmets, and gas masks. Vintage photo illustrating a group of Enlisted Men of the 298th General Hospital and some of the British civilians working at Frenchay Hospital. On May 10, 1944, the 298th Gen stood down from operations in Great Britain. When the personnel listened to radio reports of the recent Normandy Invasion, the men were disappointed and had to wait for another number of weeks before receiving alert orders! By May 16, orders were confirmed, with the 298th Gen Hosp now being gradually moved to its final staging area prior to crossing the Channel to France (this also included the 5th General Hospital –ed). According to plans, the FIRST General Hospital, the 298th, was to land in France by D+15 (June 21, 1944 –ed) and set up for operation in Cherbourg, in the Cotentin Peninsula. Finally, new orders came to move up to Colwyn Bay, North Wales, for more training, including chemical warfare and anti-gas procedures. It was already May 1944. The 298th General Hospital left Frenchay and a selected group of staff and personnel were sent for a few weeks to North Wales for fitness and other special training, after which they spent 2-3 weeks at Brockley Combe Transit Camp, south of Bristol, prior to embarkation to Normandy in July 1944. Frenchay Park was eventually taken over for a short time (May 1944 to August 1944) by the 100th General Hospital, which then left for the Continent in August 1944 and was set up in a Normandy cow pasture for the next seven weeks. The organization was to stay at Frenchay Park until May 16, 1944. During that period the Hospital was visited by quite a number US and British Army Officers. Bob Hope performed at the Hospital during one of his USO tours in the United Kingdom. 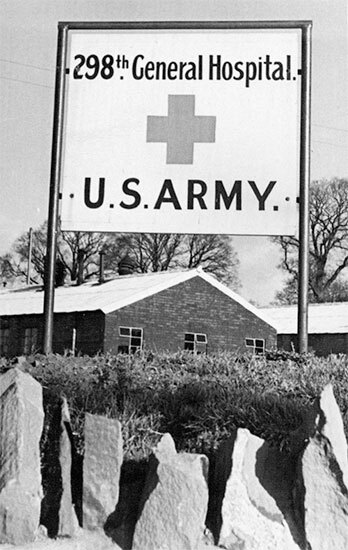 After the 298th’s departure Frenchay Hospital continued to serve as a general training center for newly-arrived US medical units, and a great deal of attention was paid to training programs as well as to inter-Allied cooperation and goodwill. US Army Medical Officers attended professional and scientific meetings with their British and Commonwealth colleagues in Bristol, Bath, Oxford and London during this period (for those interested, Frenchay Hospital was officially handed over to the British Authorities during an official ceremony dated August 17, 1945 –ed). The unit personnel finally embarked at Plymouth on July 15, 1944 and waded ashore on Utah Beach the next day, once more separated from its equipment assembly (this had happened before also when shuttling between Wales and England). The unit would only receive the missing equipment assembly July 22 after landing on the Continent. 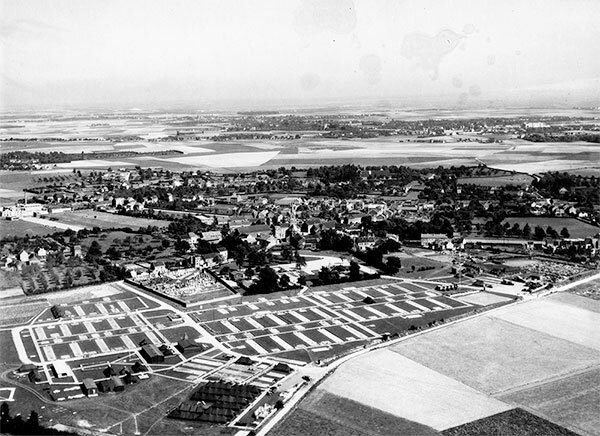 Partial aerial view of the 298th General Hospital installations in France. Mid-July 1944, the 298th crossed the English Channel, landing at Utah Beach, Normandy, France, where it would treat Allied casualties throughout the summer. The organization was assigned to occupy the Cherbourg Naval Hospital that the 12th Field Hospital was rehabilitating. The Hospital first moved into billets and houses in Cherbourg on July 17 and eventually prepared to relieve the 12th Fld Hosp while continuing cleaning and refurbishing the premises with US Engineers beginning extensive modifications and repairs needed to fit the old plant for a 1,000-bed General Hospital.. The 298th General Hospital finally opened for receiving patients July 29, 1944 amid noise and debris as the renovation and repairs would continue until October. In the meantime the unit, besides caring for patients in temporary medical facilities, kept busy with a host of minor but necessary repairs and tried to make do with always unreliable water and power supplies. Acute non-combat incurred injuries of the bones, joints, and soft issues. These cases were numerous, as many thousands of troops were working/serving at the port. Minor battle incurred wounds. Many lightly wounded battle casualties were treated, with the objective to return them directly, or as quickly as possible, to duty. Serious battle-incurred injuries. Patients with this type of injury were treated in large numbers before their evacuation to England. Other war-connected injuries. Many patients were received who had been wounded by mines or booby-traps left in place by the Germans or in the course of handling and dismantling captured German ammunition and supplies. 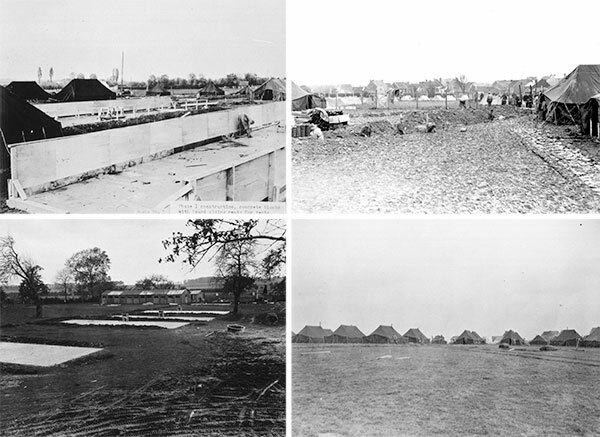 Photos taken during the different construction phases of the 298th General Hospital, at Alleur, near Liège, Belgium. Top Left: Concrete blocks (floors) and wooden board sidings are being erected. Top Right: Prisoner of War labor details at work during the early construction phase of the Hospital. Bottom Left: Concrete floors ready for construction and surgery buildings in the background. 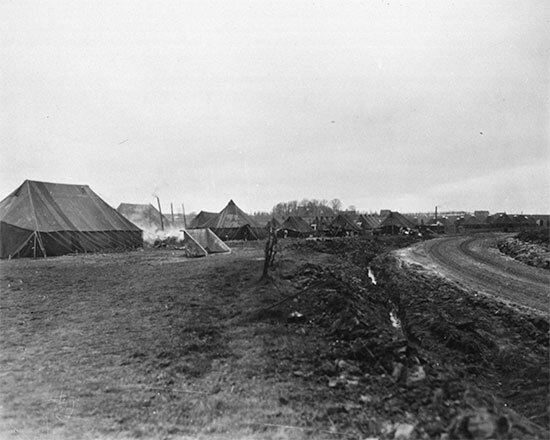 Bottom Right: Overall view of the 298th General Hospital’s tented camp in the distance. End of October 1944, the Hospital moved by train and motor convoy to a field outside the city of Liège, Belgium, a place called Alleur, only about 30 miles from the German border, where it would operate Hospital Plant # 4340. Although the city was in Allied hands, and well-protected, it would suffer tremendous damage from the German V-bombs. From October 1944 some Belgian cities came under heavy attack from V-1 flying bombs, the main targets being the port of Antwerp and the supply center of Liège. Over 6,500 V-1s were fired at Antwerp and approximately 3,000 against the city of Liège. Furthermore Antwerp received 1,350 V-2 rocket attacks, while Liège suffered 98 such attacks. Consequently it was inevitable that some Hospital units, situated in and around Liège suffered casualties and plant damage from enemy V-weapons, long-range artillery fire, and conventional bombing. From November 20, 1944 through May 1945, the 298th General Hospital was stationed at Liége, in Belgium. Here the majority of patients admitted had battle-connected wounds and injuries. Most of them were received within one to three days of primary debridement done in Evacuation or Field Hospitals. Particularly in December 1944 and January 1945, a number of lightly and moderately wounded patients were admitted because forward Hospitals had been too heavily loaded with more serious cases to receive them. The patients required debridement as well as later, more definitive surgery. Over the same period, a number of casualties were also received who had been wounded in the immediate vicinity from aerial and buzz bombs (V-1 type) attacks (between December 21, 1944 and January 20, 1945, 1,724 V-1 buzz bombs were launched against Liège, and 1,569 hit Antwerp). V-1 flying bombs exploded around the Hospital site while the staff was watching a performance of “La Traviata”. Some other Hospitals stationed in and around the city of Liège were hit, suffering destruction and human life. On some days the bombs came in fitfully, on other days almost every 15 minutes, and it was impossible to judge where they would suddenly come down. Liège had been targeted by the enemy because it was one of the largest Army supply centers on the Continent. A kind of triangle formed between Liège – Verviers – and Spa contained a number of important supply installations built up through fall with the aim to support the Allied advance toward the Rhine River. Then, following the outbreak of the German counter-offensive in the Belgian Ardennes, many casualties were brought in for urgent treatment, with the Hospital staff working continuously through the buzz bombs. Fortunately, the 298th was never hit and none of its members were killed. Maimed soldiers and civilians alike streamed into the facilities for treatment. At one time it was envisaged to move the unit if necessary, but the orders never came. A total of 6,448 Belgian civilians and 882 Allied servicemen would lose their lives during the V-1/V-2 campaign against Belgium, mainly involving the cities of Antwerp, Brussels, and Liège. While trying to cope with the crisis brought about by the unexpected German counter-offensive in the Bulge, hasty instructions were given for evacuation of Hospitals in danger of being overrun and Colonel Charles H. Beasly (ADSEC Surgeon –ed) made plans for the complete withdrawal of personnel and equipment. Fortunately, neither had to be implemented because of the stout defense put up by First United States Army troops. Some disorder followed, with Hospitals being temporarily displaced, broken up, re-attached, or re-assigned but generally speaking all other ComZ medical units remained in place, and continued operating. The 818th Hospital Center, controlling the Hospitals established in Liège (and only operational for a few days) began re-organizing for quick triage, rapid stabilizing surgery, and mass evacuation of patients. Some views illustrating the enormous destructions caused by the flying bombs, V-1 and V-2. Left: 1944, destruction caused by V-1 flying bombs in Antwerp, Belgium. Center: 1945, destruction caused by a V-2 rocket in London, England. Photo illustrating a special monument in Liège, Belgium, dedicated to the 298th General Hospital, unveiled on 21 September 2012 during an official ceremony. The 298th General Hospital spent 36 months overseas (mainly in the European Theater), training in the continental United States, traversing the Atlantic to cross over to the United Kingdom, and serving with pride in France and Belgium until fall of 1945. 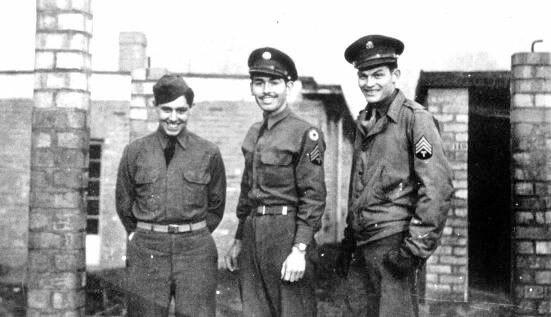 The unit was finally inactivated at Camp Kilmer, Stelton, New Jersey, October 5, 1945. 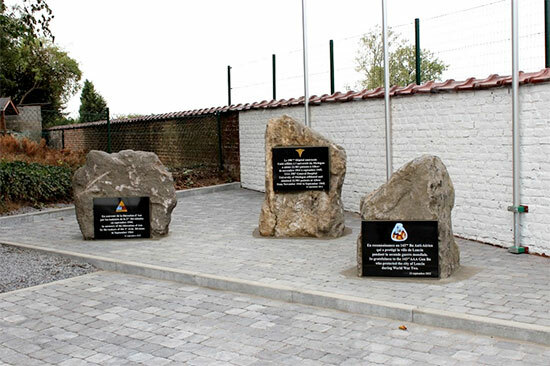 September 21, 2012, a special Plaque was inaugurated and dedicated to the heroic personnel of the 298th General Hospital who provided outstanding medical services while operating at Alleur (Liège), Belgium. The MRC Staff are still looking for additional data covering the last stages of the 298th General Hospital’s operations in the European Theater as well as a complete Personnel Roster. All inputs very much appreciated. This page was printed from the WW2 US Medical Research Centre on 26th April 2019 at 02:47.